The situation in the East of Ukraine remains tense. The number of attacks on Ukrainian positions increased. 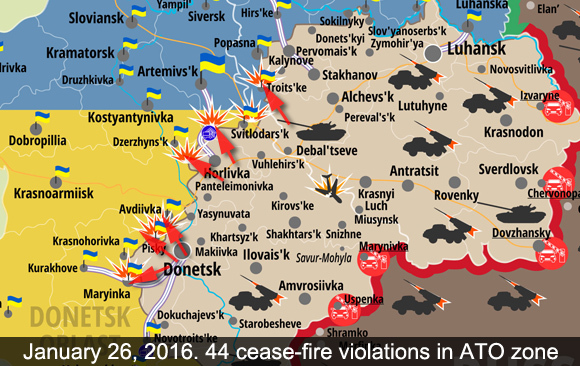 ATO Press Center reported 76 cease-fire violations in the last 24 hours, mostly near Donetsk. 4 Ukrainian soldiers were wounded. Pro-Russian terrorists used 120 and 82 mm artillery banned by Minsk Protocol. Below is the report posted by ATO Press Center today on April 6 2016, see original post in Ukrainian at www.facebook.com/ato.news. The situation in the East of Ukraine remains difficult and has a tendency to get worse. Russian-terrorist groups shelled 76 times in the last 24 hours. There were 61 attacks in the previous 24 hours. At the same time the enemy used 120 and 82 mm mortars banned by Minsk Agreements. It most difficult situation was near Donetsk. Despite multiple attacks with the use of grenade launchers, machine guns and small firearms Ukrainian solders defended their positions. They gave no chance for success for the enemy effectively returning the fire. 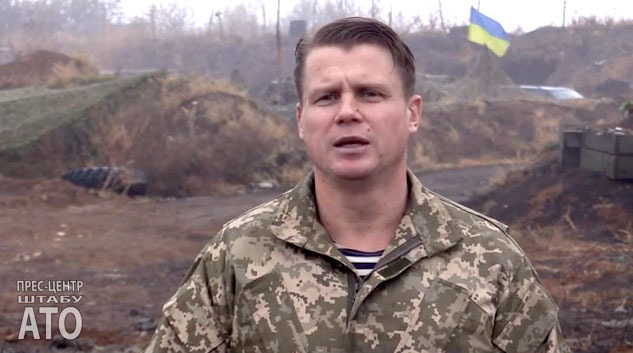 Avdiivka village remains impregnable for the enemy. Illegal armed forces attacked positions of Armed Forces of Ukraine 22 times in that area. Despite all enemy efforts our soldiers control the situation and are always one step ahead. Positions of ATO forces were shelled with the use of banned weapon near Luhanske, Zaitseve, Opytne and Pisky. Illegal armed groups were active near Mariupol also attacking positions near Shyrokyne, Vodyane, Lebedynske and Krasnohorivka, the enemy shelled our positions 35 times there using mortars. The situation in the East of Ukraine remains tense. Despite cease-fire agreement pro-Russian militants continue to attack Ukrainian Army positions, there were 44 attacks mostly near Donetsk just in the last 24 hours. Terrorists also used weapon that should be withdrawn according to Minsk Protocol. Near Pisky village they attacked Ukrainian fortifications using a tank, such weapon should be withdrawn at least 15 km away from the contact line. 1 soldier near Pisky got wounded, no KIA reported. 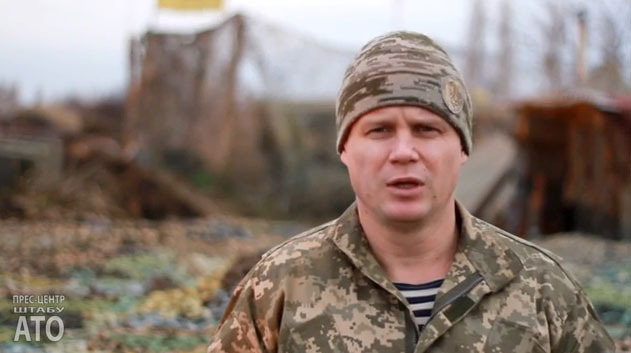 Pro-Russian mercenaries don’t stop shelling our positions in the ATO zone. The enemy attacked our positions near Opytne, Pisky, Luhanske, Novhorodske, Zaitseve and Mariinka. The situation near Donetsk Airport was most tense. The enemy was shelling Ukrainian positions using small firearms, high caliber machine guns and different types of grenade launchers. 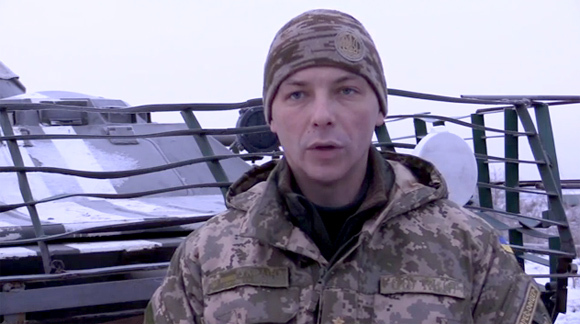 Pro-Russian mercenaries attacked our fortifications near Pisky using a tank. The situation near temporarily occupied Horlivka was also tense. Militants shelled our positions in that area near Novhorodske and Zaitseve using different types of weapon. In total the enemy attacked fortifications of ATO forces 44 times in the last 24 hours. ATO press center reported 29 attacks on Ukrainian Army positions in the last 24 hours. Pro-Russian militants violated cease-fire agreement mostly near Donetsk using small firearms, grenade launchers and weapon of APC. 6 Ukrainian solider were wounded and no KIA. The situation in ATO zone is not calm. Militants of illegal armed groups continue to violated cease-fire agreements. Most of the cases of cease-fire violations that happened in the last 24 hours were registered near Donetsk Airport. Pro-Russian criminals shelled our positions using grenade launchers and small firearms near Pisky, Opytne and Butivka coal mine. The enemy attacked fortifications of Armed Forces of Ukraine near Starohnativka using high caliber machine guns. Our positions were shelled near Talakivka (near Mariupol), and our fortifications near Luhanske (located on the border between Donetsk and Lugansk Regions) were attacked by the enemy with the use of grenade launchers, small firearms and weapon of APC. In total in the last 24 hours pro-Russian bandits attacked positions of ATO forces 29 times. ATO Press Center posted another report that covers last 12 hours. According to that Russian terrorists violated cease-fire agreement in Donetsk and Lugansk Regions 37 times starting from 6 pm last night till 6 am today morning. 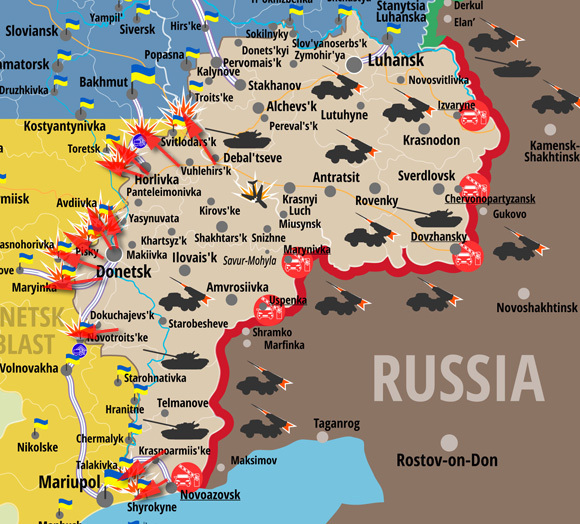 Last 24 hours in ATO zone, same as previous day, were tense. The enemy fired in all directions along the contact line. As usual most of provocative shelling happened near Donetsk. Terrorists fired in the direction of Opytne, Mariinka, Pisky, Nevelske, Novhorodske and Avdiivka using high caliber machine guns, grenade launchers and small fire arms. Mercenaries shelled Mayorske, Zaitseve, Stanytia Luhanska, Hranitne and Shyrokyne using mortars, weapon of BMP armored vehicles. grenade launchers and small fire arms. In total from 18:00 last evening and till 6 in the morning there 37 shelling. As for the previous 12 hours, ATO Press Center didn’t report the number of cease-fire violations in the East of Ukraine, so it’s impossible to calculate the total amount of Russian terrorists attacks in the last 24 hour. Obviously that number dramatically increased comparing to the last few days. Lugansk Regional Administration also reported that yesterday on November 22 one Ukrainian soldier was killed and another one was wounded by a land mine near Malynove village when they were moving on a vehicle. This village is located on the way to checkpoint in Stanytsia Luhanska, hundreds of vehicles go that direction to pick up their relatives and friends. There could be more victims if civilian vehicle got on that mine. The number of attacks on Ukrainian Army positions in ATO zone has dramatically increased. 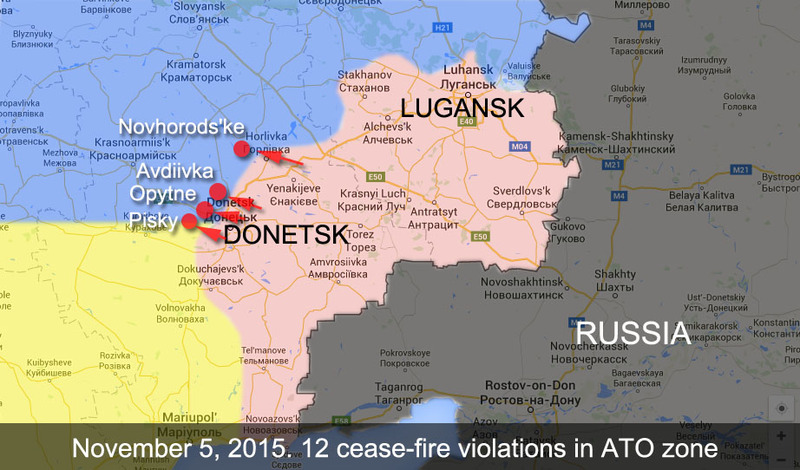 ATO Press Center reported over 50 cease-fire violations in Lugansk and Donetsk Regions in the last 24 hours. Below are the reports as they are posted by ATO Press Center. From 8:15 am November 9 till 6 pm there were 19 cease-fire violations and from 6 pm same day till 1:05 am November 10 there were 33 attacks. We also marked on Google Map all positions of the Ukrainian Army along the contact line that were attacked. Russian terrorist troops continue to shell our positions using grenade launchers, high caliber machine guns and small fire arms near Donetsk. Starting from 8:15 they shelled Opytne and Novhorodske 5 times. Mariinka, Avdiivka, Krasnohorivka and Troitske were attacked with the use of grenade launchers. Mayorsk and Dzerzhinsk located near Artemivsk were attacked 2 times. In total there were 19 attacks registered and almost all of them were provocative. Our intelligence located 2 tanks of terrorists that were not withdrawn from the contact line violating Minsk Agreements. One was in the school yard and another one was in a forest on the South-East of Zaitseve. Starting from 6 pm terrorists opened provocative fire in the direction of our positions 33 times. Near Donetsk they shelled Pisky 11 times using grenade launchers, high caliber machine guns and small fire arms, Opytne was shelled 7 times, Mariinka was shelled 4 times, Avdiivka and Krasnohorivka were shelled 3 times each. Nevelske and Kamyanka were attacked attacked by small fire arms and Verhnyotoretske was attacked with the use of BMP-2 armored vehicle and anti-aircraft guns. Violating Minsk Agreements Russian-terrorist mercenaries opened fire in Artemivsk direction and attacked Popasna and Boguslavske twice using 120 mm mortars. Besides that terrorists attacked Ukrainian Army positions near Novhorodske and Mariinka 4 times using mortars and Shyrokyne (near Mariupol) was attacked not only with the use of grenade launchers and small fire arms, but they also used 82 mm mortars banned by Minsk Agreements. It was quiet in ATO zone after 1:05 am. Attention!!! At the time when Ukrainian military continue to follow Minsk Agreements terrorists violate them everyday. Out intelligence spotted a convoy of 20 tanks near Kalinina coal mine located in Donetsk and 4 tanks that terrorist were trying to hide near their positions close to Mariinka. On November 10 terrorists continued to attack our positions in ATO zone in all directions. They totally disrespect Minsk Agreements. 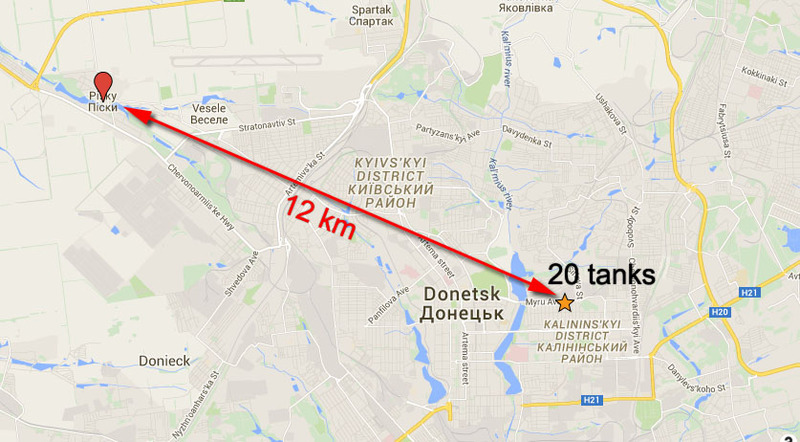 At 10:30 am Russian-terrorist mercenaries opened fire using 82 mm mortars. About 40 mines were fired at Bolotene village. 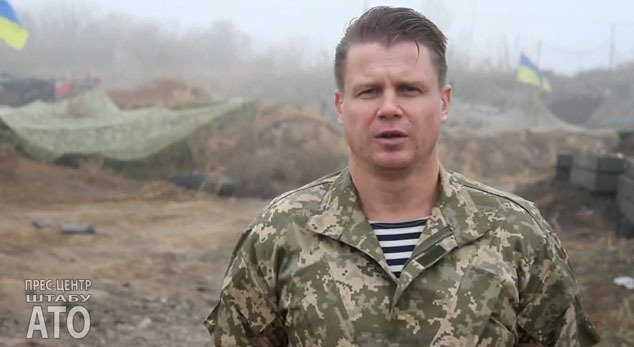 Putin’s mercenaries also attacked Mayorsk using mortars. Pisky was attacked 5 times with the use of small firearms, high caliber machine guns and grenade launchers, they also attacked Opytne, Starohnativka and Hranitne. At about 1 pm a group of about 100 men dressed in military uniform of Ukrainian type was spotted near Trudivska coal mine in Donetsk. There were also military armored vehicles near them. ATO Press Center reported that the number of provocation near Donetsk increased and Ukrainian positions were attacked 12 times at night. Terrorists starting from 18:50 and till 00:30 were using grenade launchers, high caliber machine guns and small firearms. Cease-fire was violated 12 times. Followers of the “Russian World” attacked Opytne, Avdiivka, Novhorodske and Pisky. Shelling were dine from the direction of Chemical and Cement plants, Spartak area and old terminal of Donetsk Airport, Shyroka Balka and Putilovskiy Forest. After that the night in ATO zone was quiet. 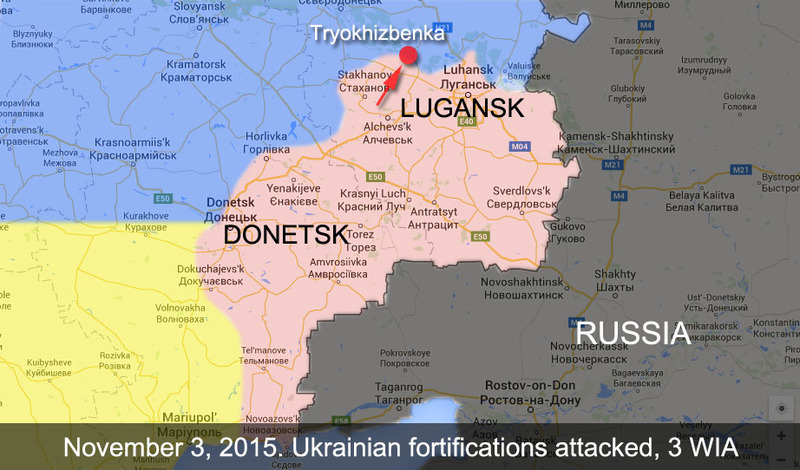 Yesterday pro-Russian terrorists attacked Ukrainian Army checkpoint in Lugansk Region, 3 soldiers were wounded. At about 15:00 checkpoint in Tryokhizbenka village of Lugansk Region was attacked with the use of automatic grenade launchers. 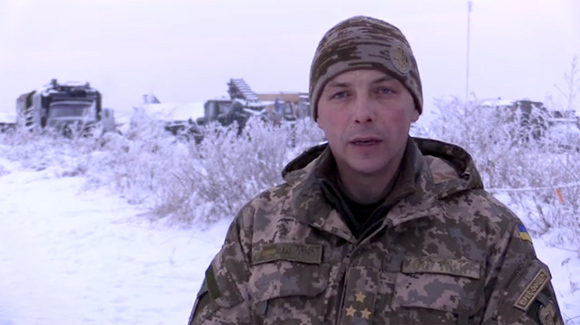 As a result of that 3 soldiers of 92nd separate mechanized brigade were wounded. Two of them got medical help right there and the third one was delivered to the hospital in Severodonetsk city. ATO Press Center also reported that on November 3 terrorists starting from 6:07 am were shelling at Ukrainian positions using small fire arms and automatic grenade launchers near Avdiivka, Opytne and Pisky in Donetsk Region. Enemy sniper was shooting at Avdiivka. Ukrainian commanders got permission to return the fire. 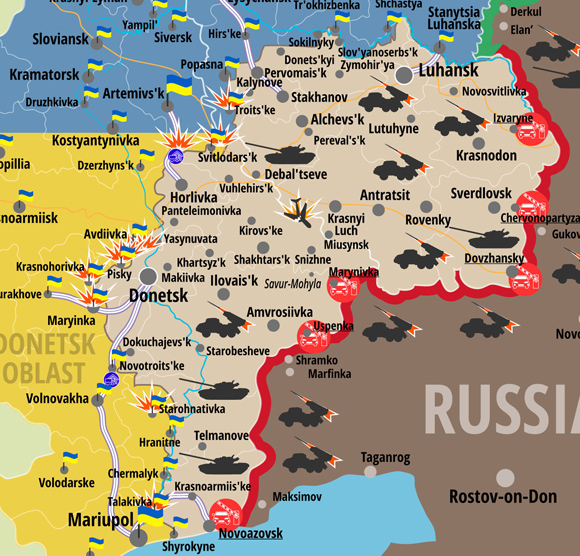 In general from 6 am till 6 pm terrorists violated cease-fire 9 times.